Cruciferous vegetables, such as Brussels sprouts, broccoli, kale, collards, cauliflower and bok choy, are known as “super foods” for their anti-cancer properties and are a good source of fiber, potassium, vitamin A and vitamin C. How you cook your veggies can affect the nutrients. Brussel sprouts can be shaved, they can be served raw in salads or they can be cooked. Brussels sprouts can also be roasted separately like in this recipe, or with other vegetables. Enjoy. Trim off the outer dry leaves, cut the bottom off and slice lengthwise. In a large bowl, toss Brussels sprouts in olive oil, and freshly cracked black pepper to coat thoroughly. You can also use frozen, unseasoned Brussel sprouts. Thaw and dry well, taking off excess water. Roast for 40 minutes instead of 20. Place Brussels sprouts back in bowl. Add remaining olive oil and balsamic vinegar, toss to coat evenly. Nutritional information (per 1 cup service): Calories 97, Total Fat 4.7 g, Saturated Fat 0.8 g, Cholesterol 0 mg; Sodium 34 mg, Carbohydrate 12.6 g, Dietary Fiber 5.2 g, Sugars 3 g, Protein 4.7 g.
Natalie Castro is a registered dietitian and the nutrition and wellness manager at Baptist Health South Florida, where she oversees the food and nutrition policy for the organization. 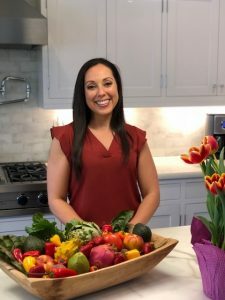 Natalie earned a bachelor’s degree in nutrition and dietetics from Florida International University and a master’s degree in nutrition and exercise science from State University of New York at Buffalo (University of Buffalo). She believes a food environment supported by healthy choices fosters healthier lifestyle habits. Natalie is certified in adult weight management by the Academy of Nutrition and Dietetics, and her research is published in several peer-reviewed medical journals.